Almost certainly a past-players match, circa late 1940’s. At first glance - St.Kilda past players. 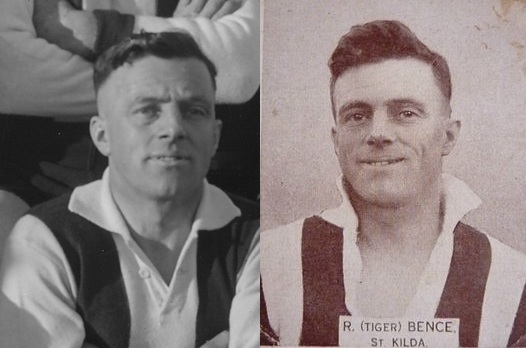 The jumper does appear to be similar to St.Kilda’s old white-dominated strip but only two of the eighteen players have a breast monogram and even these two monograms are not clearly St.Kilda’s. The players are all quite well advanced in years, in their forties, fifties and sixties. (No SLV mention of this). Past players presumably, but which team? The photo was taken at Fitzroy’s ground: the currently existing stand is in the background and the old destroyed stand is partially visible at left. There are two trainers in the group, plus one official and one mascot. The players are wearing both white and black shorts. A good, clear photo. The Photo match is with "A.Day" in a 1929 Oakleigh Team Photo in the Australasian. Bert Day finished with St Kilda in 1928. An Early 1953 Argus article indicates that Bert Day was a Selector for the St Kilda team, so he obviously maintained a relationship with the club in the right time period. The Encyclopedia of League Football confirms tat Day played for Oakleigh after leaving St Kilda.